Fabio Borini has completed his move to Liverpool from Roma and become the first signing of Brendan Rodgers's Anfield reign. The Reds have refused to disclose how much they have paid for Italy forward Borini, although the fee is reported to be £11m. Borini, 21, worked with Rodgers at the Chelsea academy and on loan at Swansea in March 2011. "I've got the trust of the manager. 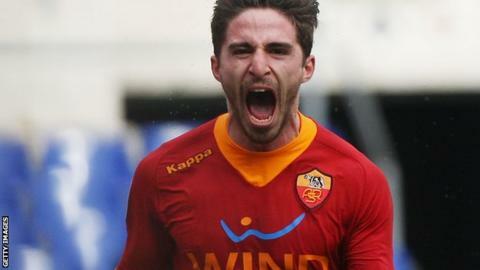 I'm proud to be here," said Borini. The former Bologna player will wear the number 29 shirt. Borini scored six goals in 12 appearances for Swansea before the forward joined Parma on a free transfer after his contract expired at Chelsea. He then moved to Roma. "Liverpool is a top club which has won a lot of trophies in the past - and will do so in the future we hope as well," Borini told Liverpool's official website. "I used to play 4-3-3 with the manager and he is very good to play football for. It is great to play football for him because you can have fun and you can get results. "I could see at Swansea the people loved him because the football was attractive. People like to see football played like this." Rodgers believes Liverpool fans will enjoy watching Borini in action. "He's one of the few young players in the full Italian squad," said the Liverpool manager. "I'd anticipate that over the next two or three years he'll really progress and I'm sure do very well for Liverpool. "Fabio fits the model of what we're trying to do in building not only for now, but also for the future. "He's a big talent, 21 years of age, he scores goals, and his passion, focus and concentration is a very important part of his game - and a big part of what you want from a player." Liverpool already have forwards Luis Suarez and Craig Bellamy, and Rodgers admitted he would consider allowing England striker Andy Carroll to leave the club on loan. Rodgers, who saw midfielder Maxi Rodriguez join Newell's Old Boys on Friday, is looking to make at least one more signing before the start of the season.